This article refers to cars that are specifically referred to by a game's HUD as a "Sentinel XS". For the "XS" variant of the Sentinel referred simply as the "Sentinel", see Sentinel article. A Sentinel XS in GTA Vice City. The Sentinel XS is a sportier variant of the regular Sentinel luxury car in Grand Theft Auto: Vice City, Grand Theft Auto: Vice City Stories and Grand Theft Auto V. The car is related to the Mafia/Leone Sentinel, gang car of the Leone Family in Grand Theft Auto III and Grand Theft Auto: Liberty City Stories. A Sentinel "XS" also exists in Grand Theft Auto IV, although it is officially referred to as a "Sentinel" by the game, not a "Sentinel XS". Refer the Sentinel article for the GTA IV rendition. "You try paying for a high-end one of these - and alimony." 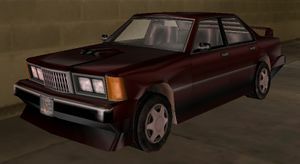 Ever since the Sentinel's introduction in GTA III, a sportier variant has been present in every GTA game, excluding GTA San Andreas. The Sentinel XS's main visual distinction from the regular Sentinel is its spoiler and rear window grilles; performance-wise, the car is faster than the regular Sentinel, suggestively alluding on the BMW M5, although the car, like regular Sentinels, more closely resembles the BMW 5 Series E28, which was not used in the M5 series. There also appears to be resemblances of the Citroën Xantia (1993–2001), particularly the bumpers. In GTA Vice City Stories, the Sentinel XS is not given the same aesthetic modification as the game's Sentinel, resulting in the car appearing more distinctive in the game. The Sentinel XS also emit a different engine sound than the regular Sentinel. The Sentinel XS is the preferred gang car of the Mendez Cartel in GTA Vice City Stories. The Sentinel XS in GTA V is hardtop Coupé,sportier version of the regular Sentinel.It is based on the BMW M3 (2007-2013) most likely due to it's prominent carbon roof,mirrors and front splitter.It performs better than the regular counterpart due to it's improved handling,increased top speed,stiffer suspension and stronger brakes. Spawns in a parking lot near the Escobar International Airport terminal building. Two Sentinel XSs appear outside the Mendez Mansion in Prawn Island. Spawns behind one of the northern most hotels at Ocean Drive in the long alleyway. Beside a hotel near the Vice Point Mall, north Vice Point. XS is a homophone of "excess," which may refer to the cars modifications that don't actually affect its performance in GTA IV. In the November 8, 2012 Game Informer preview of GTA V, Michael's wife, Amanda, is stated to have driven a "Sentinel XS". It is currently unknown if the car follows GTA IV's naming convention of simply referring to a Sentinel with "XS" badges as a "Sentinel" in HUD, or if the car is to be officially referred as a "Sentinel XS".However in the final version of GTA V,she has changed back to a regular Sentinel with the license plate resembling Krystal,which is actually displayed "KRYST4L". Sentinel, and the "XS" Sentinel in GTA IV. Mafia Sentinel, a gang variant of the Sentinel in GTA III and GTA Liberty City Stories comparable to the Sentinel XS. This page was last modified on 21 March 2015, at 19:27.